heers teh burfday fairy to say HAPPEE BURFDAY to Pinkbunny, ImMortallity, Rodney Dill, Drgnfly an evreewun else hoo haz a burfday today! 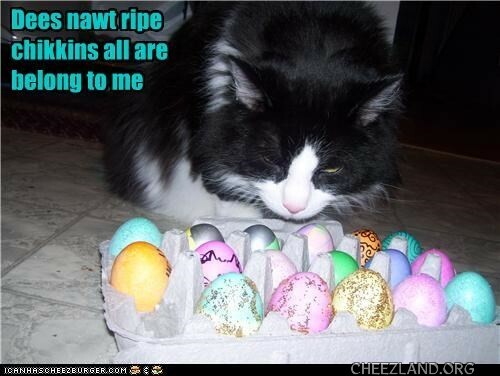 i haz bringd yummy bunneh-shaped caeks in fudjy an wite flavrs wif fluffy frosting an jellibeen eers an noses, iskreem, fizzy frooty party punch, fansee shiny party hats, an goodie bags filled wif bownsy ballz that look like colurd eggs, fuzzy eester chik finger puppets, kandee, an fansee decorate-yor-own egg stikkers! an a big swish ob teh burfday wand to making all yor burfday wishes come troo! happitayle birfday to teh birfday peeps. and is pinkbunny an easter bunneh? Happee Birfingdae, Pinkbunny, ImMortallity, Rodney Dill, Drgnfly an evreewun else hoo bees teh birfingdae peeps tudae!!!! they’z still green. an pink. an yello. an purplol. an orinj. Ai hoeps wen deys ripe, dey cums owt in teh saem cullers wot dey ar nao.